This is believed to be the one and only original half tone litho advertisement negative that was used to create the famed Vinolia Otto Toilet Soap ad. The ad was published only once, in the April 6, 1912 edition of the London Illustrated News just days before the sinking. 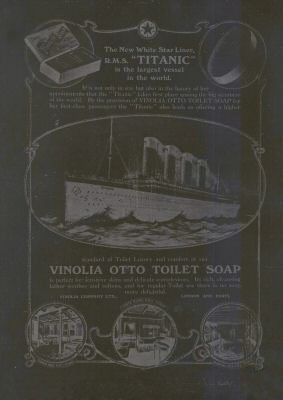 Vinolia Otto Toilet Soap was provided for First Class passengers on the maiden voyage of the Titanic. The rare original newspaper ad is considered a valued piece of history and highly desired by many Titanic collectors. The popular ad is frequently used in modern reproductions and can be found in the traditional b&W version or a smaller hand painted variation that usually claims it is a copy of a vintage sign or ad. This ad was never printed in color or in a variation different from the original shown. This piece has been thoroughly inspected by a respected photography expert and deemed a vintage time-era authentic negative. It is a one of a kind museum quality "find" direct from the British print company who created the etching, thought to be forever lost in time. Buy a giclee print from this original litho negative for about the same price as you will pay for a quality reprodction. It is professionally printed on the finest quality 11" x 17" artist paper with a viewing area slightly larger than 10" x 14" and comes with a signed Letter of Authenticity. This is not a reproduction as typically seen in many different styles. This is how the ad appeared on April 6, 1912!